Summer is great, and the sunshine is a welcome change after dreary winter days, but sometimes the heat can get to be too much! 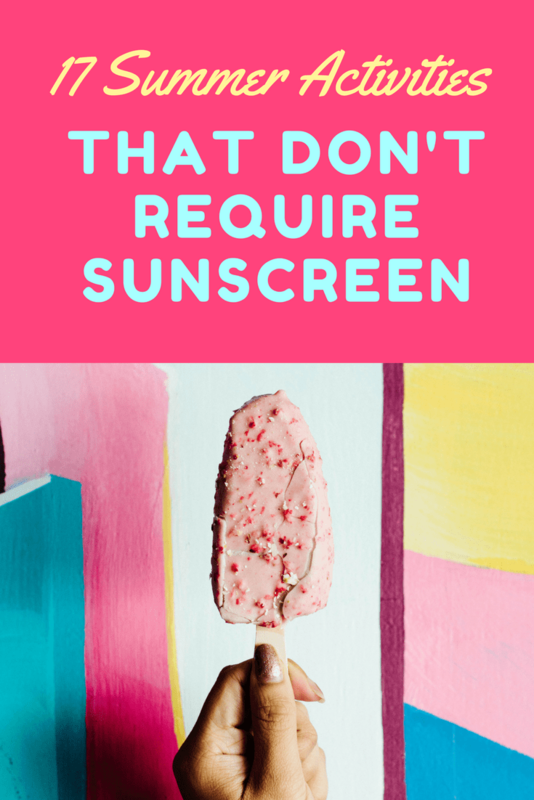 My kids LOVE to swim and play in the water, but when it’s time to take a break from those UV rays, here are 17 ideas for summer activities that don’t require a thick layer of sunscreen! Every summer, our local bowling alley participates in the “kids bowl free” program. It’s two free games per day, all summer long. You just have to register online once and you’re good to go! Just pay for shoe rental or wear your own shoes for a totally free summer activity. Technically this activity is an outdoor activity, but since it’s at night, it counts. 🙂 Many cities provide some kind of summer entertainment through the local parks and recreation division. Check out your city’s website for a summer schedule. Our kids love to go watch a movie on the giant inflatable screens, and since it’s outside at a park, they’re free to run around and play if the movie gets too long. Usually on Saturday mornings, the hardware stores will host kids’ clinics for building fun little projects. I’ve seen them offer things like pine car derby racers and bird houses. They do fill up quickly and you usually have to register early, so be sure to check online before just showing up! 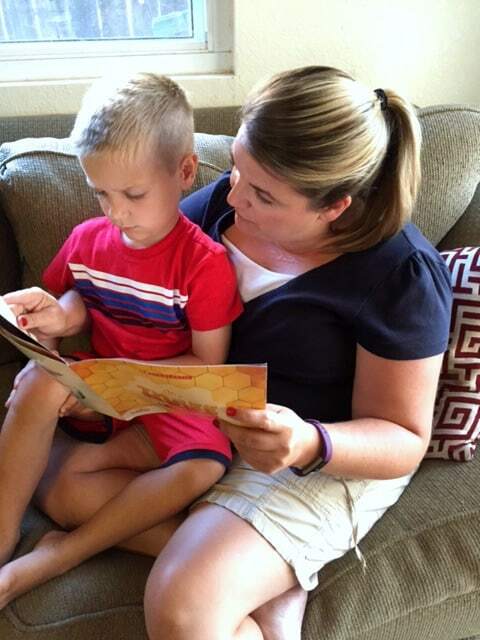 Every local library will have some kind of summer reading program to join. We just signed up for ours this week and scored three coupons for In-n-Out! The prizes change every week, so kids stay motivated to keep reading. Our library also has fun activities for kids on Wednesday mornings. Sometimes there’s a magic show, or jugglers and balloon artists and sometimes it’s an interactive things like a LEGO building clinic. Check your local library website! 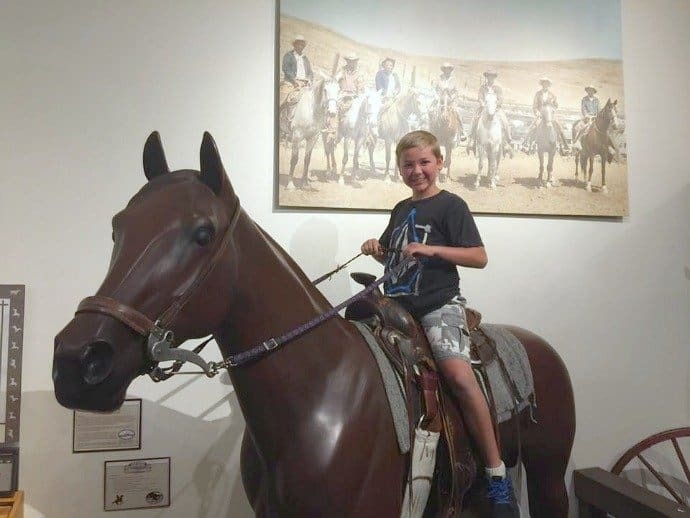 We have both a regular museum and a kids’ museum in our town. The regular museum has a great “hand on” section for the kids, though. The nice thing about museums is that they are usually very inexpensive or even free. You can spend just an hour or two exploring without feeling like you’ve wasted a lot of money. It’s also a great educational outing for the whole family! If you live in a cold weather area, you might think of ice skating as a winter activity, but it’s perfect for the summer! You can be active, stay cool and keep out of the sun at the same time! Some rinks may even participate in the kids skate free programs, so be sure to check your area for listings. I love to walk around in a cool, dark aquarium. It’s so soothing and pretty! It’s easy with kids to rush right through an exhibit and miss a lot, so check for an activity map when you first enter. Most aquariums will have some sort of “scavenger hunt” to work through and that will keep the kids engaged. I love puzzle rooms! If you aren’t familiar with the idea, you and a group of friends are “locked” in a room and you can’t escape until you’ve solved all the puzzles inside. There’s little to no instruction- just go in and start looking around for clues to solve within the time limit. This is something you would do with older kids and it’s a blast! OK, I’m stretching it a little bit with camping, but hear me out. KOA camping is different than “normal” camping. Last year we went to one and it had a lodge with games to play, a little cabin just for kids with all sorts of activities and crafts, and a bouncy house! There were tons of things to do inside to stay out of the heat and the sun. There was also the usual- a pool, hiking, bike paths and even a mini golf course. Check out this post for some great camping tips and tricks! Load the kids in the car and just drive! Check out a town you’ve never been to and see what there is to discover. If you are in the same county, you can go visit their library and check out some books and movies you might not have seen before. Ask around for the best place to eat or get ice cream. Sometimes the unplanned activities end up being the best. This might be torture for some people, but it’s a great place to people watch. 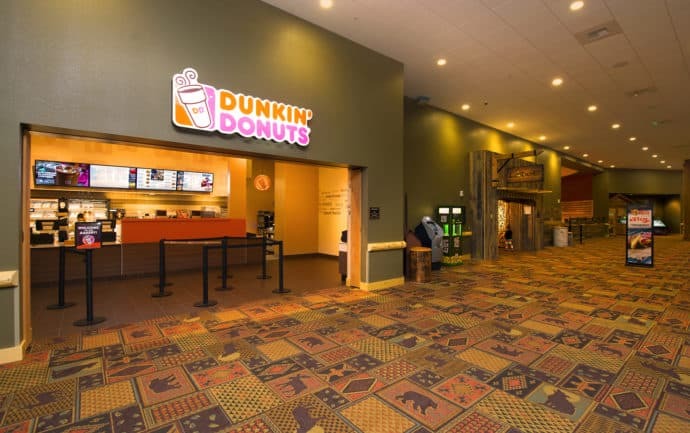 🙂 Most malls have a small play area of some kind, and we ALL love those delicious pretzels that smell so good when you walk in the door! Tell everyone they have an imaginary $100 to spend and then just walk through and window shop while you decide what you would spend your money on. Designate a night to be family game night and pull out a few board games that everyone can play. Sorry is a great game that appeals to all ages. If you can’t agree on a game, let everyone choose their favorite and then set a timer. Play every game for a certain amount of time and then move to the next one. Enjoy root beer floats or some other special treat while you play! Your local hobby and crafting stores always have classes of some kind going on. Sign up for a beginner sewing class or try your hand at cake decorating. This is another activity that’s more suited for older kids. Check out the store websites for details and sign up early, as they usually fill up quickly. I’ve saved the best for last. 🙂 Everybody loves a water park in the summer, but an indoor water park is even better! We are lucky enough to have a Great Wolf Lodge close enough to us to make it a quick overnight getaway. I really like that the only way to get access to the water park is to stay in the hotel. It keeps it from getting too crowded and everyone is there for the same thing-family fun! 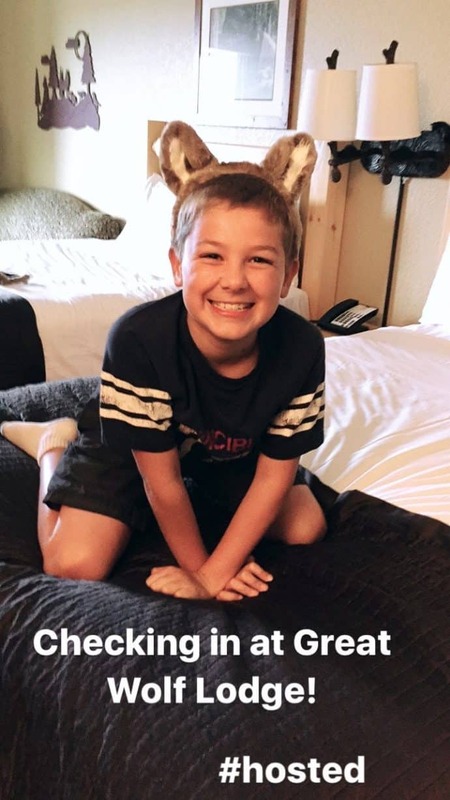 We were able to visit Great Wolf Lodge in Anaheim for a quick getaway and my kids had a blast! You get access to the water park when you check in, as well as all day the next day (even after checking out) so it’s like a mini vacation. When you’re starting to feel like a prune, there are tons of other great activities to do! While we were there, I shared some fun on my Instagram Story. Media discounted rate was provided to facilitate this review. All opinions are 100% my own. We checked in and got our awesome wolf ears and then hit the water park. After that we ate dinner at the Wood Fired Grill (the crispy chicken sandwich is delicious but ask for extra sauce!) When we were done with dinner, we caught the story time going on just outside the restaurant. Then we went downstairs to check out the arcade and get dessert at Bear Paw’s Sweets and Eats. It’s not vacation unless you get ice cream, right? The next morning we had Dunkin’ Donuts for breakfast (there’s one right inside the hotel) and then headed back to the water park to play some more. We ordered pizza “to go” from Hungry as a Wolf and ate it right inside the water park. It’s nice not to have to dry off before going to get something to eat! The kids were tired and we wanted to beat the traffic, so we left by 2:00 to head home. However, if you want to, you can stay until the water park closes! They even have lockers and showers so you can clean up before heading home. If you can make it happen, I highly recommend an overnight trip to Great Wolf Lodge! It feels like a full vacation that’s crammed into just two days. They’ve even opened up new rooms so families with more than 6 people can still stay together! The built in “wolf dens” are adorable bunk bed “rooms” for the kids. 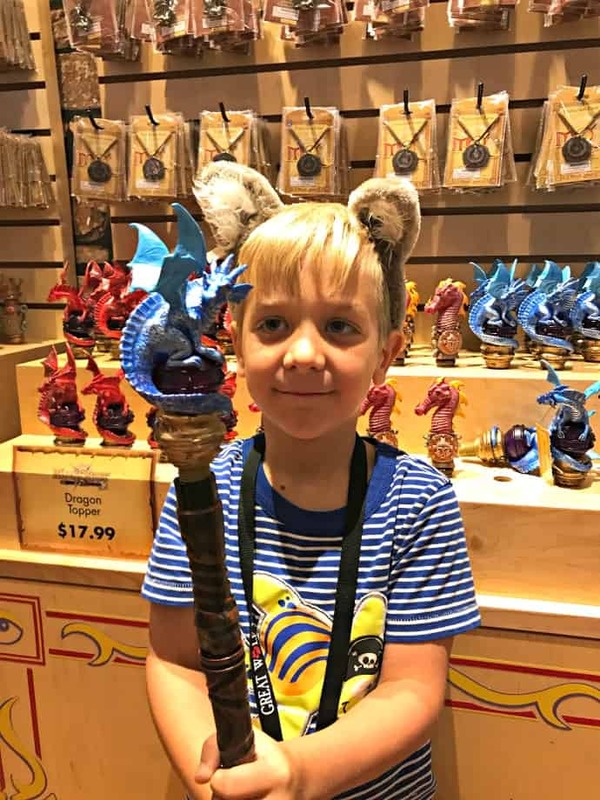 They even have special features that activate when you wave a Magiquest wand in front of them! Speaking of MagiQuest. Wow. This takes interactive play to another level! We were going up and down elevators, exploring different floors in search of the gems we needed to complete our quest. This was our first time playing. Now that we all have wands, we can bring them back to complete a different quest next time. When the final quest is completed, we get to battle the dragon, Charlock, who lives down near the arcade. It’s a truly immersive experience and my boys loved it. For the summer, they are treating guests to family movies by the outdoor pool, Raccoon Lagoon. It’s perfect for little ones because of the zero-depth entry and the deepest section is only 3 feet. My kids loved it! Grizzly Jack’s Bar and Grill is right there for buying snacks and drinks while you watch, too! We had a blast and can’t wait to go back! Check out the Great Wolf Lodge website for more details and attractions, because I barely scratched the surface of what’s available. What do you like to do with your family in the summer? Did you think of an activity that I forgot to mention? I’d love to hear it in the comments! Better yet, if you’re been to a Great Wolf Lodge, tell me about your experience! 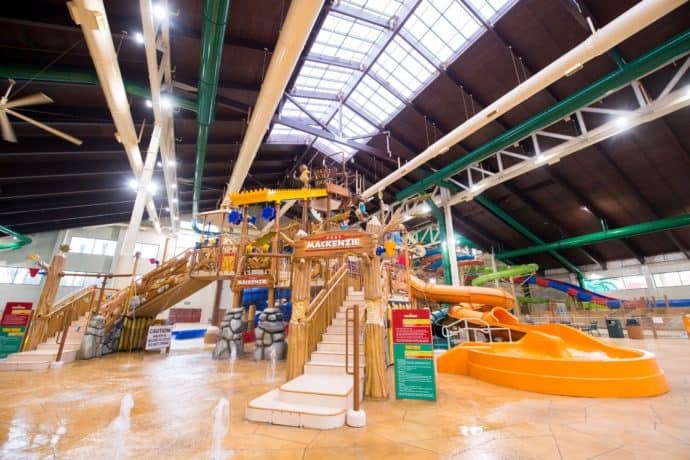 Great Wolf lodge is on our bucket list of cool places to go! I must be a kid at heart because I want to do all those things on your list. The photos are amazing. I had no idea Lowe’s and Home Depot had classes for kids. These are all great ideas! My kids are big enough now to enjoy these and GWL is definitely in our wish list of things to do this summer! We were so excited to find that one was opened just 30 minutes from us!! There’s a great section for smaller kids in the water park, too! It’s shallow and full of fun toys and there’s a couple slides that are easy to climb up and slide down for even the early walkers. We spent a lot of time in there the first time we visited. You’ll love it! Great ideas! 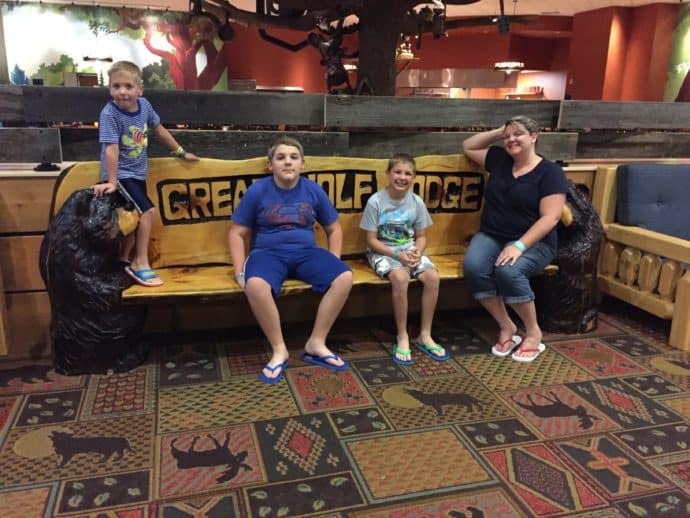 We loved visiting the Great Wolf Lodge in Kansas City! I think when Carrie and Nathan went back and visited one year you all went to that one. They came home talking about it and when I looked it up, Washington state was the closest one to us! 🙂 I’m so glad we have one within driving distance now! Great wolf lodge is fun for grandparents too! WOW! Hey….this Grammy wants to go to GWP…hmmm I suppose I should grab a grandkid or two so I don’t look weird! Wow it looks like a blast! Summer movies sometimes free or just a buck! We are hoping to go to the GWL this summer – one just opened an hour away. So many great ideas on this list! Great ideas! GWL is on our bucket list! So many great ideas! The Great Wolf Lodge would be a dream come true for my kids! Those are great ideas for the summer! I really want to go to Great Wolf Lodge? Love these ideas. 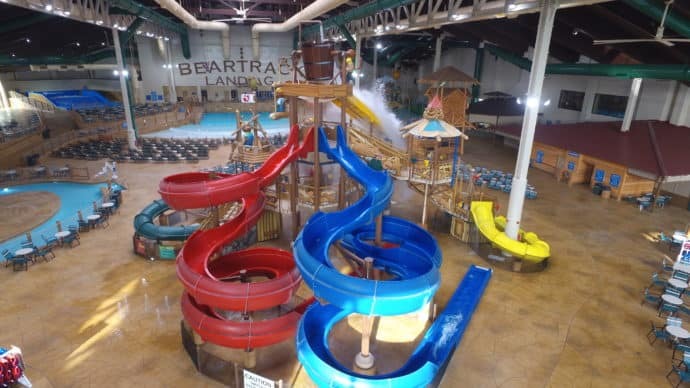 Great Wolf Lodge is on our bucket list!